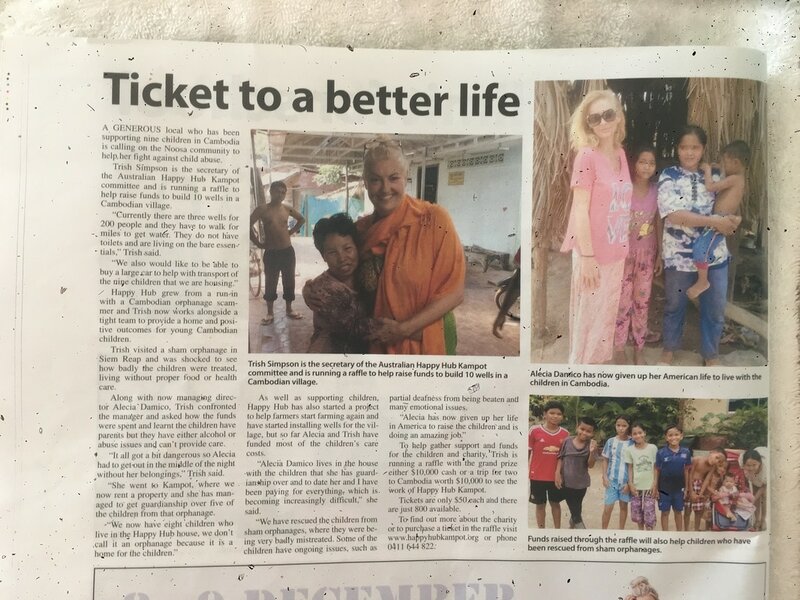 A NOOSA woman is turning her run-in with an overseas Cambodian orphanage scammer into positive outcomes for the young Cambodian children caught up in the deception. And Trish Simpson is not alone, having attracted a local tight-knit support team which aims to make a difference for youngsters in genuine need of help. "It all started when I went to a sham orphanage in Siem Reap and found how badly the children were living without proper food or health care,” Trish said. Trish said she and another woman Alecia, who was motivated by the plight of these "orphans” to also visit, confronted the manager and demanded to know where the funds were going. "It all got a bit dangerous so Alecia had to get out in the middle of the night without her belongings,” Trish said. "She went to Kampot, where we now rent a property and she has managed to get guardianship over five of the children from that orphanage. Trish said it turns out the children have parents, but they have either alcohol or abuse issues and are unable to provide care for the children. "However we do encourage contact with the parents under supervision where possible,” Trish said. "We have started a farming project to help farmers to start farming again, and year round, by installing wells for a year round water supply. Trish said they have received plenty of assistance from the village chiefs to make sure the funds go to the right areas. "We have just started a raffle to raise money for 10 wells, seeds, fencing and also a mini-van so that we can transport the children,” she said. They have started a small local tour business to not only provide employment but also an income for the Happy Hub house. "To date Alecia and I have been paying for everything so it is a big stretch,” Trish said. "I live in Noosa and travel to Cambodia at least two times a year to oversee what is going on, and spend time with the children. Trish's local supporters have organised a raffle with the grand prize either $10,000 or a trip for two to Cambodia worth $10,000. She is waiting for the online ticket seller to link to the website, but physical tickets are now available. To find out more go to: www.happyhubkampot.org. WHEN Trish Simpson decided to do something a bit more useful with a week's holiday than fly to Singapore, she had no idea she would be setting up a charity six months later.Ms Simpson, of Sunrise Beach, has applied to register Happy Hub Kampot, a charity to help provide a better life for children and their villages in Cambodia. She and her daughter, Torrey, 17, became involved after travelling to Cambodia in February with Torrey's friend, Luka, 15, to stay and help out an an orphanage. "I was going to go to Singapore for a week and then I thought that's a bit boring,” she said. Concerned about the children's living conditions, Ms Simpson and another visitor, Alecia Damico, confronted the orphanage director about its financial affairs but were dissatisfied with the answers, of lack of them. With the help of the orphanage manager, they obtained permission from the families of five of the children to relocate five of them to another house. The house, which is now a happy haven for seven children, is being supervised by the former orphanage manager and Ms Damico, supported by Ms Simpson and her daughter from Australia. "There's seven kids that Alecia has custody of. She's raising them and we try to have it so the parents can be involved with the kids,” Ms Simpson said. Ms Simpson said a lot of the parents put their children in orphanages because of poverty so they are also working to help villages improve their incomes by encouraging them to grow crops such as sugarcane and moringa. Ms Simpson said charity status would allow Happy Hut Kampot to fundraise and it would become more attractive to donors once donations were tax deductible. "At the moment, it's Alecia and I paying for everything, and as you can imagine, it's a bit of a financial stretch,” she said. "We need to start a charity so at least we can start doing some fundraising to get it going, because the more villages we can get through to to earn and have a safe and secure income, then the less they'll have to send their children to orphanages. 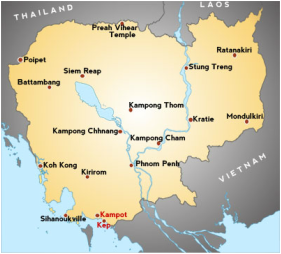 Ms Simpson said Happy Hub Kampot would team with Project Cambodia, another Coast charity, to help each other with expertise and fundraising where possible. "If we team up, the more we can do to help each other,” she said. Ms Simpson said besides financial support, Happy Hut Kampot could use people with agricultural expertise who might be willing to help the Cambodians improve their farming.